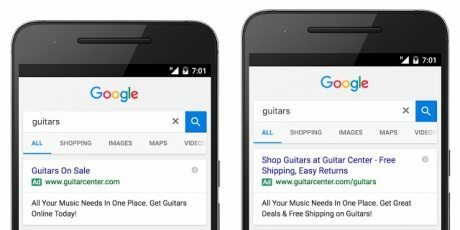 Back in May, Google introduced an entirely new way their search ads are laid out. Rather than the traditional 25 character headline with two, 35-character description lines, we now have two, 30-character headlines and one,80-character description line, giving us nearly 50 percent more text in our ads. This is the first major change in text ad format since AdWords began over 15 years ago. The introduction of this ad format eliminates the necessity of creating separate mobile-preferred ads in each of your ad groups. Instead, you now have the ability to designate a specific landing page for users who click on your ads via a mobile device. This allows us the ability to tailor the experience for our users regardless of what device they use to click an ad. This enhanced mobile experience is critical to integrate into your strategy, as recent research has shown that users who are brand loyal will leave for a competitor if they are subject to a poor mobile experience. Some preliminary findings from our PPC team may or may not be what you would expect. So many factors go into running a high performing paid search campaign that the ad text alone cannot suddenly increase performance, rather it is one of many aspects of getting a PPC campaign to run like a well-oiled machine. An account needs to be targeting the correct keywords & locations at the right cost, yet in a visible position on the SERP with the proper content and calls to action in the ad text, taking a user to a high-quality landing page (regardless of device!) that will then get them to your conversion point. Google will be phasing out the ability to create new standard text ads at the end of January 2017, so expanded text ads will soon become the norm, however, they have not yet announced a date in which these ads will stop showing altogether. What this tells us is now is the best time to begin your expanded text ad experimentation. Add in one or two ETAs alongside your current ads. Find out what works and what doesn’t work. Rotate these ads evenly until they accrue enough statistics to be able to determine the best ads. 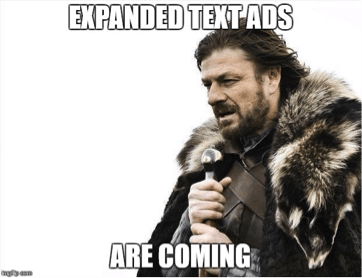 Once you are sure you have high performing expanded text ads in your ad group, you can then begin phasing out your standard text ads before Google does it for you.